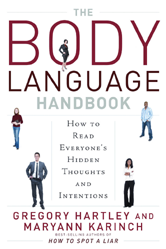 In The Body Language Handbook, the authors use candid photos of real people in stress-free situations, then juxtapose them against others showing the same people responding to different kinds of stimulus to illustrate the power of body language. Chapter 1 - What Do YOU Mean by That? Chapter 2 - What Is Universal?